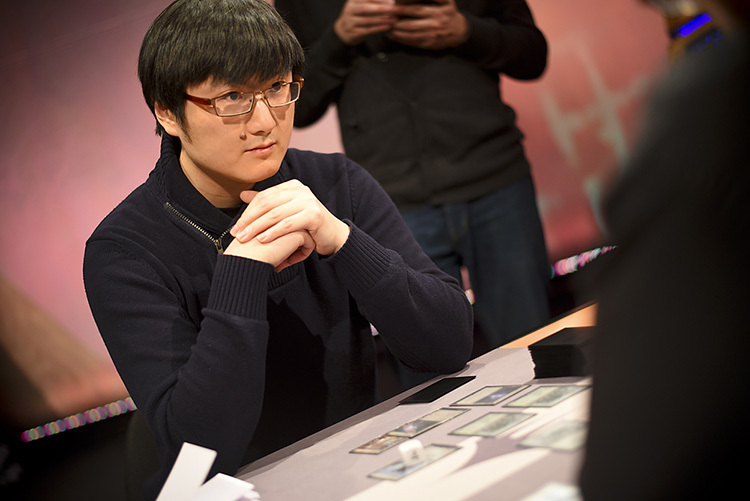 Jiachen Tao's run to the Top 4 was the Cinderella story of Pro Tour Oath of the Gatewatch. Entering the tournament with an Eldrazi deck the majority of his teammates on East West Bowl weren't confident enough to play, he tore through an unprepared field and found himself in a position to draw into the Top 8 in Round 16. Unfortunately for Tao, his Round 16 opponent, Hall of Famer Shuhei Nakamura, had other plans. Already locked for Top 8, Nakamura played in order to achieve a higher seed in the Top 8 and possibly eliminate his bad match-ups. Not only was Tao forced to play the final round after he thought he was safe, he lost the match to Shuhei Nakamura, throwing into doubt his Top 8 candidacy. Fortune and tiebreakers smiled on Tao, and he advanced to the Top 8 as the final seed, which meant a rematch with Nakamura. Tao earned his revenge in that match, and was now on to the semifinals to face Nakamura's teammate and another Hall of Famer, Luis Scott-Vargas. The fan favorite was making his first Pro Tour Top 8 appearance since 2011, and despite his fears of a bad match-up with Tao's deck, had an opportunity to both avenge his teammate's loss and advance to the finals. Jiachen Tao's incredible run has only continued through as he matches up against Hall of Famer Luis Scott-Vargas in the semifinals. "How confident were you in your deck this weekend?" Tao ask Scott-Vargas before the match began. "I wasn't sure about it," Scott-Vargas admitted. Any fears Scott-Vargas might have had were unfounded, as his Colorless Eldrazi deck had dominated the tournament. The combination of fast mana in Eldrazi Temple and Eye of Ugin led to explosive starts with Thought-Knot Seer and Reality Smasher, and there was no question that the Eldrazi deck was the best in room. Except, perhaps, for Tao's Blue-Red Eldrazi deck. Access to Eldrazi Skyspawner gave his deck much-needed blockers against the aggressive decks in the field, while Eldrazi Obligator gave him game against anything bigger. In the Eldrazi mirror, Obligator could serve as a huge trump card to swing the match. Scott-Vargas led things off, with a modest Blinkmoth Nexus to start the game, holding Dismember to fend off any early aggression from Tao. At least, that's what he planned for. No amount of planning could prepare the Hall of Famer for Tao's opening turn of Eye of Ugin into double Eldrazi Mimic and two-power Endless One. As Scott-Vargas untapped for his second turn, he found himself facing down six power worth of creatures. He fell to 14 life as all he could summon was his own Mimic to try and fight back. Dismember took care of Tao's follow-up Reality Smasher, and one of his own allowed Scott-Vargas to begin the offensive. 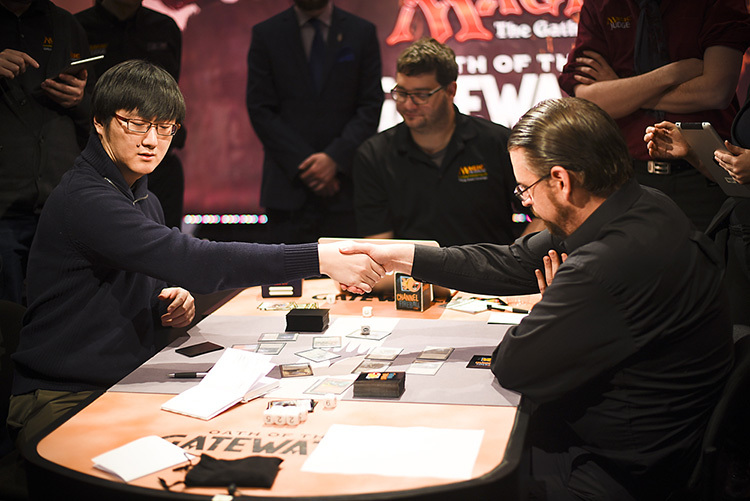 That offensive quickly stalled by Tao's Drowner of Hope, and after drawing a card for his turn, Scott-Vargas conceded the first game of the best-of-five match. Scott-Vargas may have been on the play for the second game, but it was Tao that made the first action, placing a lucky Gemstone Caverns into play before the game began. After that, it was all Scott-Vargas early, with Eldrazi Mimic and then Matter Reshaper teaming up with Blinkmoth Nexus to begin the assault. Tao slowed it down with a timely Dismember on the Nexus, and then found a land to cast Thought-Knot Seer and remove Scott-Vargas's final non-land card in Oblivion Sower. Tao, like many of the Eldrazi decks in the tournament, is capable of some of the format's most explosive starts. The game devolved into a board stall after that, with both players searching for a way to break the stall. All the while, Scott-Vargas's Blinkmoth Nexus was slowly poking away at Tao's life total, though it was far from a guaranteed path to victory given the slow clock. Still, it nearly got there itself. The Blinkmoth pecked Tao all the way down to 3 life, and with the end in sight, Tao decided to get aggressive, sending his entire team at Scott-Vargas to force some blocks. The combat ended favorably for Tao, though it left him defenseless should Scott-Vargas find a stall breaker. When Matter Shaper died and revealed just that in Reality Smasher for Scott-Vargas the players found themselves tied at one game apiece. The third game was a razor-close affair from the start, with a land-light Tao revealing a hand of two Drowner of Hope, Eldrazi Obligator and Thought-Knot Seer. It was an extremely potent late game, and one Scott-Vargas hoped to avoid. He took out the Thought-Knot Seer and used a Gut Shot on a Scion token to slow down Tao's ascent and take him off colorless mana. The ploy worked, as Tao was forced to play out the Obligator as only a blocker. While he was slowly whittling down Tao's life total, Scott-Vargas couldn't find anything to punch through. That allowed Tao to cast Drowner of Hope with the life totals at 12-11 in Scott-Vargas's favor. With the Drowner and the Scion tokens he had on board, Tao could hit Scott-Vargas for 11 damage—not quite enough. Still, with a second Drowner in hand that would provide the final reach needed, he was content to pass the turn back to the Hall of Famer. Scott-Vargas made the most of it, casting Thought-Knot Seer off the top of his deck to remove the second Drowner. That eliminated any hopes Tao had of attacking soon, though he did work to build his board with Vile Aggregate and a Thought-Knot Seer of his own against the hellbent Scott-Vargas. Scott-Vargas has reminded players and viewers at home why he is a member of the Pro Tour Hall of Fame. The problem for Tao was that Scott-Vargas reached the critical threshold needed to activate Eye of Ugin first, and he soon began a stream of Oblivion Sower and Thought-Knot Seer. With the writing on the wall, Tao conceded the game. "I got beyond lucky that game," Scott-Vargas admitted as they shuffled for the next one, referring to the top-decked Thought-Knot Seer that had cleared out the second Drowner of Hope and allowed him a way back into the game. Lucky? Maybe. 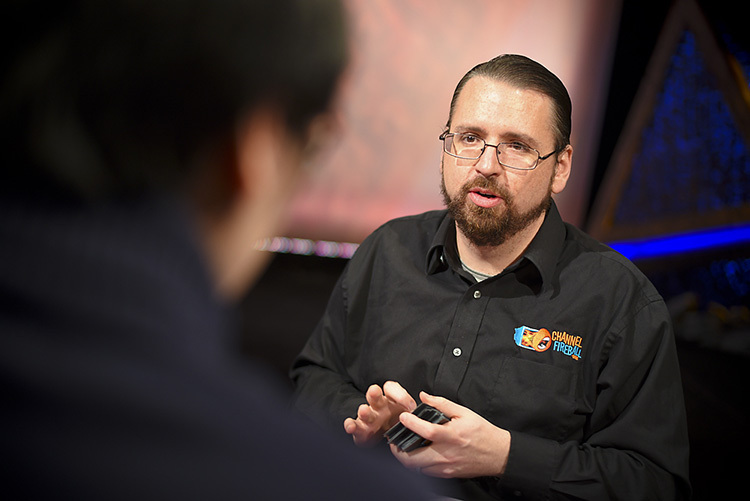 But Scott-Vargas had also maneuvered a difficult game into a spot where his deck could reward him, and it had worked perfectly, putting him just one win away from the finals. Unfortunately for Scott-Vargas, luck was not on his side in games 4 and 5. Both looked remarkably similar: Scott-Vargas was forced to mulligan while Tao had one of the classic Eldrazi starts his deck has quickly become known for: early creatures followed by Reality Smasher followed by Eldrazi Obligator to seal the game. When Scott-Vargas tried to fight back from a mulligan to five in the final game, Tao had a second-turn Thought-Knot Seer followed by a third-turn Reality Smasher followed by a fourth-turn Eldrazi Obligator to steal Scott-Vargas's 4/4 Endless One and end the match in the blink of an eye. 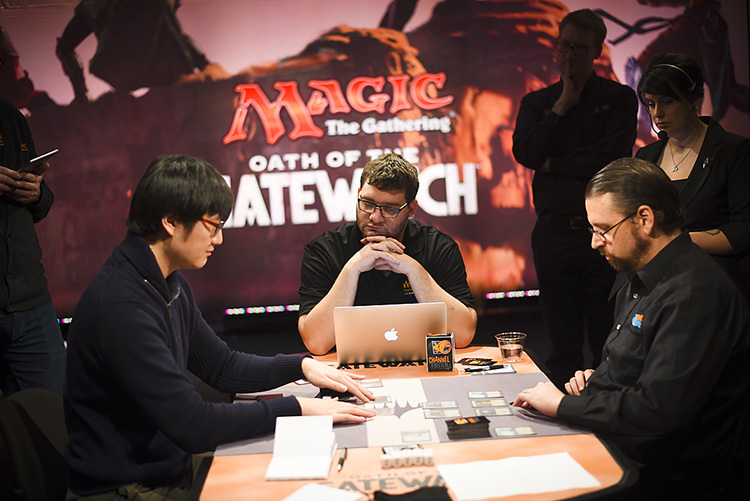 With that, Scott-Vargas extended his hand to the first-time Top 8 competitor, and Tao found himself just one match away from the title of Pro Tour Oath of the Gatewatch. Jiachen Tao defeats Luis Scott-Vargas 3-2 and advances to the finals!